RESTAURANT REVIEWS FOR SOUTHEASTERN NEW ENGLAND. Confession time: Gina and the Big Dog have been holding out on you. We’ve been telling you about all these great restaurants in the Southcoast region, but not about the one near the very top of our list. We love Not Your Average Joe’s, a small regional chain whose closest restaurant to us is on Route 6 in Dartmouth. We go there whenever we find ourselves west of New Bedford. Or north of New Bedford. Or near New Bedford. We bought a Jeep from a dealership across the street, only because we could envision long delicious lunches while we waited for oil changes. Last summer we managed to convince ourselves that Route 6 in Dartmouth was on the way to Foxborough (it is not) so we could stop for lunch on our way to the Patriots’ training camp. Let’s do a review! we exclaimed. This is delicious! we raved. What a wonderful spot! we enthused. But for you… nothing. No commentary on cilantro-laced corn garnish, no photos of succulent scallops. Frankly, here’s the problem: we don’t want any more competition for a seat at the comfortable bar. But we do feel kinda bad about holding out, so here are reparations. Not Your Average Joe’s is a wide open space, from dining room through bar area and into the kitchen. Clever Southwestern-inspired decor makes it work, and even at a crowded happy hour, conversation is comfortable. The center of the bar provides an entertaining view of the pizza prep area and wood-fired oven. Our most recent visit was for a late lunch on a cold and drizzly day, and we were pleased to see that the menu had changed subtly with the season. Gone were the sunny avocado slices, replaced by warming butternut chunks. With a basket of delicious chunky bread served with a peppery parmesan oil, we dove into a bottle of Clos du Bois cabernet ($30), a bottle we like enough to buy for evenings in The Doghouse. The Big Dog ordered a Backyard Burger ($9.99) with cheese, and yes, it tasted like something that might have come out of our Weber, but for the accoutrements — a gleaming soft bun, a sliver of pickle, a soupcon of mustard. He choose greens as an accompaniment in lieu of fries and earned an entire pint of salted caramel ice cream points, redeemed later at home. 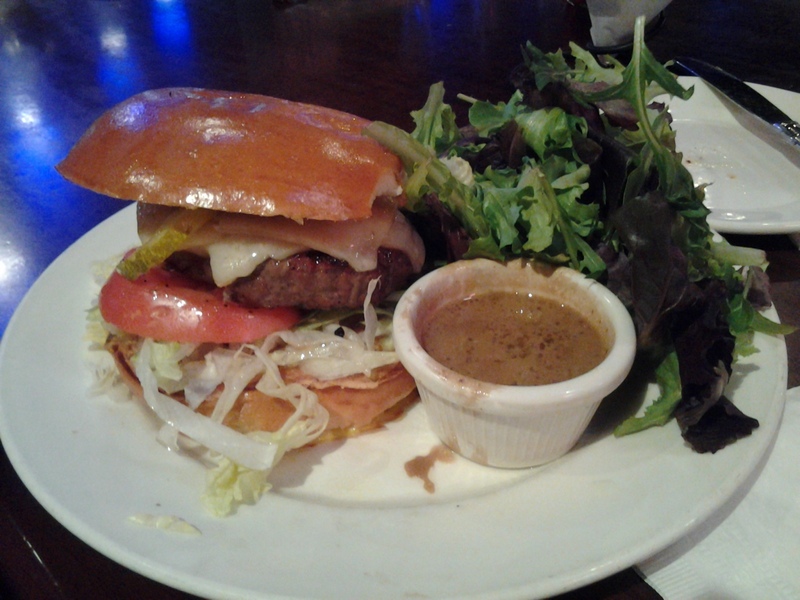 The burger was perfectly cooked and delicious. Gina started with a Not Your Average Salad, $3,99 with entree: a melange of young greens with the unexpected addition of hunks of blue cheese and blobs of dried tomatoes in oil. Love either and you’re in heaven. Hate both, like Gina does, and you’re still extremely happy with the remaining fresh salad. For an entree, Gina picked the chicken enchiladas ($11.99). Two rolled corn tortillas arrived atop yellow rice with black beans, and under an outstanding herb-y poblano crema sprinkled with pumpkin seeds. The enchiladas were meaty and delicious throughout, but each roll’s crunchy end was particularly delightful. The folks next to us at the bar ordered what we’re guessing was the raspberry sorbet ($6.99, like all desserts) and we apologize for not being able to take a photo of the beautiful presentation, for fear of seeming totally creepy. Take our word for it — the dessert was surrounded by piles of fresh fruit and poufs of whipped cream and looked outstanding. So, to summarize: the food’s okay, the atmosphere is okay, and you probably shouldn’t go here. Especially when Gina and the Big Dog have a reason to be in Dartmouth, or anywhere near there. Chow: Gina and The Big Dog tell you where to eat in southeastern New England.